Since the 1970s, we have been warning in Monthly Review about the enormous dangers inherent in imperialist strategies designed to turn around the slow decline of U.S. hegemony within the world capitalist system. U.S. economic, military, and financial dominance have been ebbing for decades, leaving the United States in the position of a wounded mastodon within the world at large, a threat to all around it. Washington has repeatedly tried with very limited success to reverse this slide in its hegemonic role by means of geopolitical expansion, aimed at increasing its “strategic assets” across the globe. The result has been a constantly expanding theatre of global conflict. In a little more than a decade, beginning with the fall of the Soviet bloc and the disappearance of the USSR from the world stage in 1989–91, the United States entered into one war after another aimed at “regime change” and the reassertion of U.S. power, including the Persian Gulf War, the Kosovo (Yugoslavia) War, the Afghanistan War, and the Iraq War. Following the 9/11 terrorist attacks, the George W. Bush administration declared a permanent state of war against terrorist enemies throughout the world (later supported by Obama), using this as a justification for imperialist interventions in country after country. Under the Obama administration—with Hillary Clinton serving as Obama’s first secretary of state—this same dynamic led to the invasion of Libya and the unleashing of a devastating proxy war against Syria. Crucial to the entire U.S. geopolitical strategy under Obama was the encirclement of Russia, now the world’s second largest oil producer after Saudi Arabia, and a reemerging superpower. NATO under U.S. leadership supported an ultra-right coup in Ukraine in February 2014 that deposed the elected government. When Moscow responded by annexing the Crimea after a popular referendum and backing the resistance of Russian nationals in the Ukraine along its border, the Western powers accused it of “invading” the country. Tensions between Washington and Moscow were further heightened by Washington and Riyadh’s enlisting of extremist pro-Salafist forces (including al Qaeda in Iraq) with the goal of toppling the Assad regime in Syria. This opened the way (as indicated by General Michael Flynn, former head of the Defense Intelligence Agency, now Trump’s National Security Adviser; see the Notes from the Editors for November 2016) to the rise of the Islamic State (also known as ISIS or Daesh)—initially viewed by Washington as a tool with which to overthrow the Syrian state. The growth of the Islamic State led directly to the Russian military intervention in Syria in 2015 in order to prevent ISIS from marching into Damascus, while also enabling Russia to shore up the Assad regime and defeat U.S. ambitions. Hillary Clinton, in her campaign for the presidency, promised to regain the upper hand in Syria by establishing no-fly zones there, which would have meant shooting down Russian, as well as Syrian, planes, thereby threatening global thermonuclear war. With the rise of the Trump administration the new Cold War with Russia has been put on hold. Trump’s rapprochement with Putin, coming at the same time as widespread accusations of Russian interference in the U.S. elections, have fed an anti-Putin hysteria among many Democrats, who blame Moscow for the unexpected Trump victory. (The real reasons for Clinton’s defeat were the decided rejection of neoliberalism by mainly white workers in the Rust Belt, coupled with widespread voter suppression aimed at non-white voters in swing states, which went largely unopposed by a Democratic National Committee that had already itself done all that it could in the primaries to suppress votes by Sanders supporters.) Still, viewed from a geopolitical standpoint, it is clear that Trump’s peacemaking overtures toward Russia were not the product of an irrational whim, or the result of simply giving into Putin, but represented a major shift in U.S. grand strategy in which China was to replace Russia as United States’ main official adversary. The new administration has indicated that among its principal geopolitical goals are: (1) an escalated war on ISIS through the introduction of U.S. ground troops (beginning with artillery forces), (2) reversing the nuclear agreement with Iran, and (3) targeting China as the principal U.S. “enemy” (“Donald Trump’s Plan for China Relations Is to Be Unpredictable, Adviser Says,” Guardian, January 27, 2017). The new U.S. Secretary of State Rex Tillerson (former CEO of ExxonMobil) has already floated the idea, during his confirmation hearings, of a U.S. naval and air blockade of China’s human-made islands in the South China Sea, which would likely be greeted by China as an act of war. Trump has also approached Taiwan and questioned the “one China policy.” The main area of agreement between Trump and his new Secretary of Defense “Mad Dog” James Mattis (the former U.S. supreme commander in the Middle East who, ironically, in spite of his personal appellation, is now seen as a restraining force on Trump) seems to be that the United States should be prepared for war with China. As Mattis declared more than a decade ago, China, in the view of the Pentagon, is the new U.S. “peer competitor.” However, the best way to get ready for a future war with China is not simply by “planning [abstractly] for China twenty years from now,” but rather by learning the necessary lessons on how to fight such a war from the ongoing conflict in the Middle East today: Iraq “is the greatest training ground in the world. For the German [Nazi] troops,” he added, “it was Spain” (“The Monks of War,” Esquire, March 2006). The hair trigger in all of this is Trump’s loose talk with respect to nuclear weapons, indicating that they might be used on any number of state and non-state targets—including ISIS (“Donald Trump’s Very Confusing Thoughts on Nuclear Weapons, Explained,” Vox, January 18, 2017). Meanwhile, Trump is proposing a major expansion in U.S. military spending. The foregoing suggests that various sections of the U.S. ruling class are increasingly panicked by the decline in U.S. power in the world and the effects that this will have on their positions within the global hierarchy. Losing confidence, they have demonstrated a growing support for the use of heavy-handed military means to maintain the U.S.-dominated global order, enlisting the population as a whole in a patriotic quest for increased geopolitical dominance. Whichever party was to occupy the White House after the elections, all the indications were that a more aggressive U.S. military posture abroad was in the cards. The main dispute in this respect at the top was whether primarily to target Russia or China. In this respect, the Trump administration’s grand imperial strategy of directly confronting China, the world’s fastest growing economic powerhouse, before it is too late from the standpoint of U.S. world hegemony, is a change of emphasis rather than broad aims. It promises an even more aggressive, nationalist-imperialist posture, one in line with the Trump administration’s overall “America First” stance; its building of a wall between the United States and Mexico; its policies of restricting immigration and imprisoning and deporting undocumented workers; and its neofascist view of the United States and the world. In the new White House, a welcome mat has now been put down for white supremacists, such as Steve Bannon of Breitbart, Trump’s chief strategist and senior counselor, now appointed a member of the National Security Council. These developments taken as a whole can only be seen as increasingly ominous for those who remember the 1930s and ’40s. In recognition of this, in January 2017, scientists at the venerable Bulletin of Atomic Scientists moved the doomsday clock, now 70 years old, 30 seconds closer to midnight. It is currently set at two and a half minutes to midnight, symbolizing that the world is closer to Armageddon than at any point since the introduction of the hydrogen bomb in 1953 (Kennette Benedict, “Doomsday Clockwork,” Bulletin of Atomic Scientists, January 11, 2017, http://thebulletin.org/doomsday-clockwork8052). For these reasons, the rebuilding of the U.S. peace movement on a mass basis, and integrating that with the climate movement and with the worldwide struggle for social justice, needs to be a primary goal for U.S. radicals in the weeks, months, and years ahead. 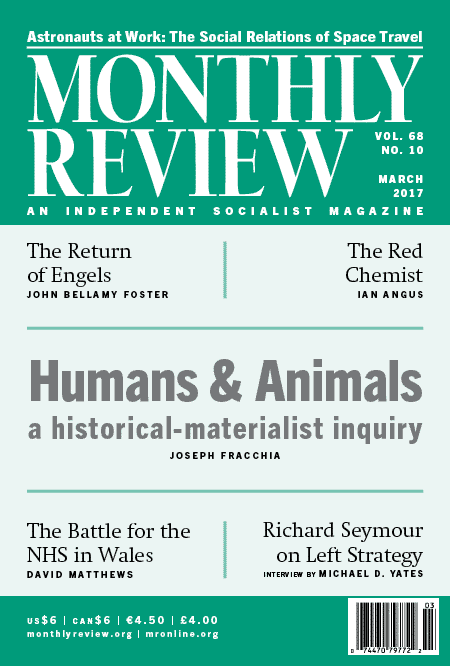 The Review of the Month for this issue of Monthly Review, “Organisms and Objectifications: A Historical-Materialist Inquiry into the ‘Human and Animal'” by Joseph Fracchia, provides a major reinterpretation of Marx’s materialist conception of history, based on Marx’s corporeal conception of human beings as material, bodily animals. Fracchia unearths a deeper understanding of Marx’s critique of capital, uniting materialism, ecology, natural science, political economy, feminism, theories of the body, semiology, and much else. 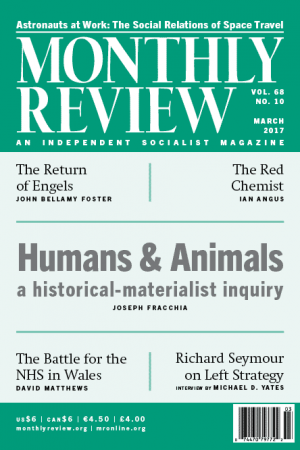 In the process, he offers ways of linking many crucial questions, including topics addressed in this issue of MR, such as Peter Dickens’s article on space medicine and the body, David Matthews on health systems, and Ian Angus and John Bellamy Foster on classical Marxism, science, and ecology. We are proud to announce the launch of MR Online. This is a dynamic publishing platform aimed at all MR readers, but especially a newly arising generation of activists, who are looking for timely analysis of national and world events, coupled with the deeper critical perspective that has been the hallmark of MR. The new MR Online website already contains the entire archive of MRzine articles (newly indexed by author and topic area), but with a significant upgrade in functionality. The site offers a streamlined submission process and a host of improvements for searching, indexing, commenting, social media connectivity, search engine optimization, and much more. The editorial objective of MR Online is to make the overwhelming and confusing stream of mainstream news comprehensible from a critical-revolutionary standpoint. We will cover a broad range of issues and topics—e.g., LGBTQ struggles, police brutality, war, imperialism, geopolitics, mass media, propaganda, white supremacy, trade-union struggles—while maintaining an internationalist focus, including translations from intellectuals and movements abroad. We will maintain a firm grounding in Marxian political economy, but will be open to the wider world of radical perspectives. We welcome contributions from MR and Monthly Review Press authors, past contributors to MRzine, and especially writers new to the magazine. Those interested may submit work using the online form: https://mronline.org/submissions/. Climate & Capitalism (http://climateandcapitalism.com), an online ecosocialist journal edited by Ian Angus and now hosted on the MR website, is celebrating its tenth anniversary this year. Since it began on January 29, 2007, the magazine has published around 2,500 articles, reviews, editorials, and interviews. We at MR would like to congratulate Angus and C&C for playing a leading role in the development of ecosocialism over the last decade. Happy Birthday, C&C!